The SS Satara was a cargo vessel, first launched in October 1901. The ship was over 130 meters long with a beam of 17 meters. The Satara‘s first voyage to Australia was in September 1902 and she completed many other voyages to and from and within Australia before the fatal decision to sail between Seal Rocks and Sugarloaf Point was made. The Satara hit Little Edith Breakers, a reef that rises with seven meters of the surface. The Satara sank. The wreck of the SS Satara remained there until it was then rediscovered in September 1984 by a group of divers. 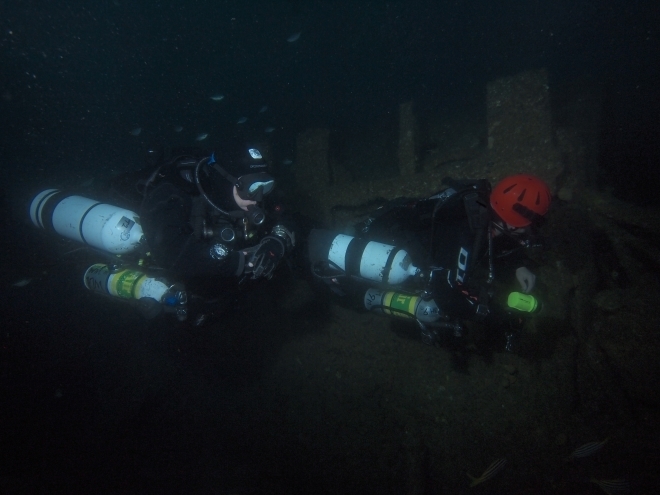 The wreck lies upright at a depth of 40-44 meters. The stern is on reef and the bow on sand. 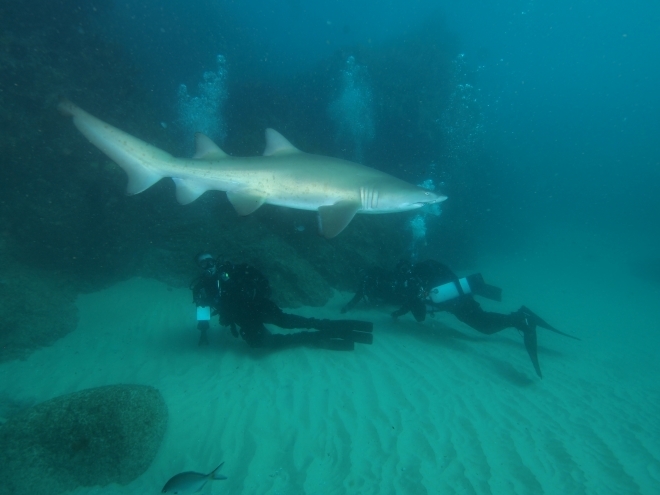 A few weeks ago in early July I took a dive trip to Forster to dive the wreck of the Satara and with grey nurse sharks. We were blessed with fantastic weather for this trip, which was nice seeing that most of the weekends in June had been blown out due to rough seas. The aim of the first day of diving was to explore the Satara wreck for our first dive, and then a reef dive with grey nurse sharks for the second dive. We loaded the boat in Forster on the morning of the first day and then drove down to Seal rocks (a 45 min drive South) where the boat picked us up for the first dive. After a 15 min boat ride we had arrived at the wreck of the Satara. The seas were flat with around 1 meter swell and a fairly moderate wind chop. levels and depths on the same wreck! 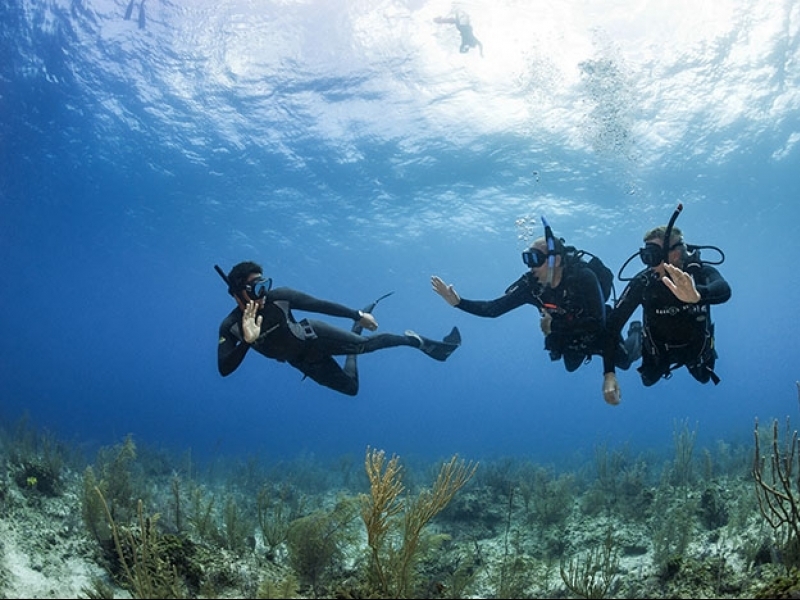 Whilst the Deep divers were limited to 40 meters and 9 minutes bottom time, the Tec 50 divers were able to dive to 45 meters and stay on the bottom for more than 25 minutes! I was fortunate enough to have been teaching the Tec 50 group. As we completed our dive checks on the boat and at the surface – whilst dealing with a mild current, we then descended to the deck of the wreck in just under 40 meters. We were greeted with around 12 – 15 meters visibility, where we completed more equipment checks before starting our exploration of the wreck. 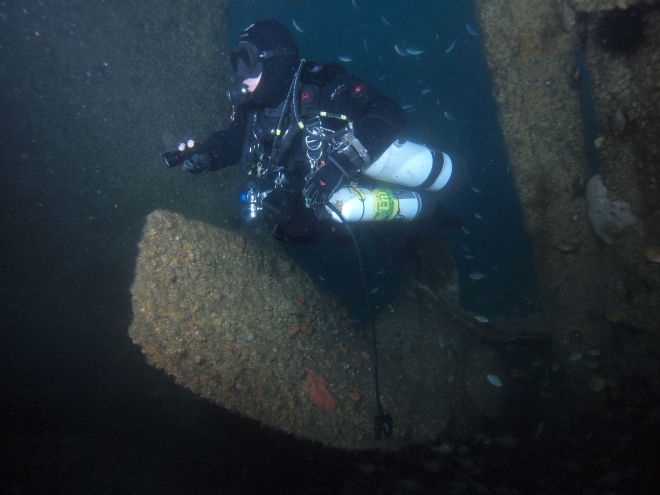 I had dived this wreck a few years prior, but could not remember much of it (maybe due to narcosis…). A very light current on the bottom had us swimming against it towards the stern, which worked out perfectly as I was eager to see the propeller which sits upright above the sand at 45 meters. I had the students swim in and out of the propeller whilst I photographed them and the large schools of fish that inhabited this area. 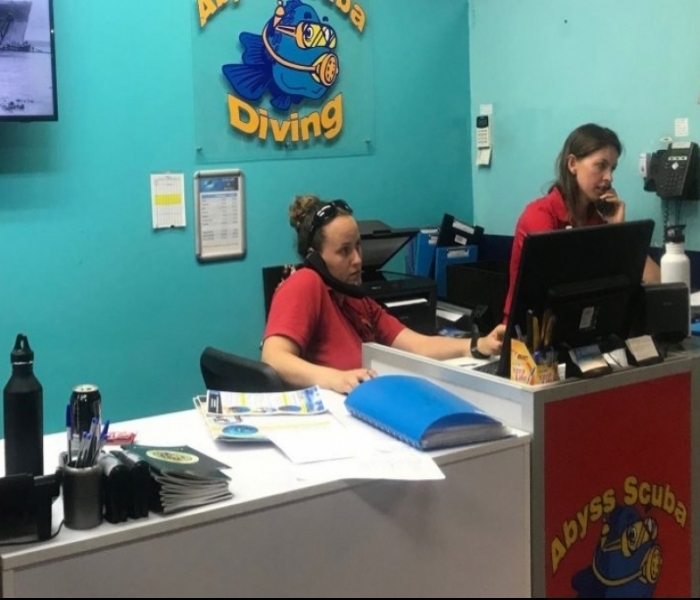 After 22 minutes they students decided (as agreed before he dive) that it was time to return to the anchor line (which only took a couple of minutes!) and start their ascent and decompression. Both groups of students said they thoroughly enjoyed their time on the wreck, with only the Deep divers wishing they could have stayed for longer! We then steamed back to Seal rocks for our surface interval before heading back out to little Seal rock for our second dive. We were a little unlucky on the first day with the current, and were forced to dive on the sheltered side of little seal rock where unfortunately we did not encounter any grey nurse sharks. We were however graced with the presence of 3 seals, with the adult male regularly diving to check us out! We then spent the evening debriefing on the day and reflecting on how great the diving had been! On day 2 we once again made our way back to the wreck of the Satara to explore new areas unseen on the first day. 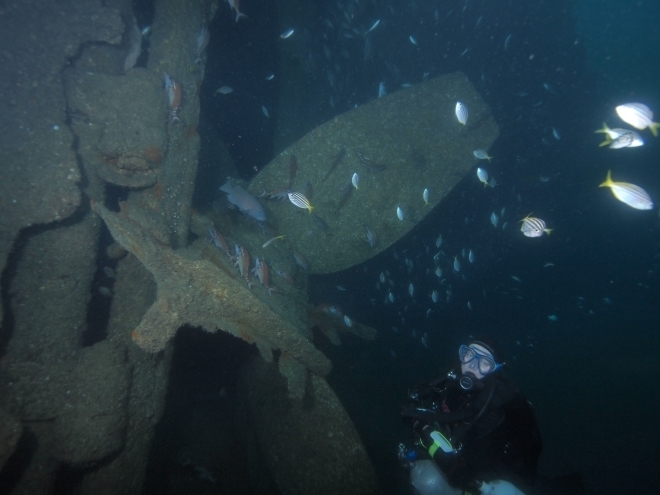 With similar seas and visibility to the day before, we descended to the wreck and began exploring. I took photos of some of the other divers at the 2 large boilers near mid-ship, before once again heading to the stern to take more shots of the propeller and surrounds. After another round of decompression, we were back on board and ready for our surface interval. Back at seal rocks beach we picked up some students that were learning to dive, and took them to a small rock just off shore from the beach. The instructors that were teaching these students had informed us that there were 12 or so grey nurse sharks just below us, so we decided we need go no further, and we completed our 2nd dive for the day right there! A very strong current greeted us as we jumped in the water, so we spent the dive sheltering from the current on the inside of the rock. Lucky for us, this is what the grey nurse sharks were doing as well! The boat dropped us back to shore after the dive and we said our goodbyes to those that were driving back to Sydney that afternoon, before the rest of us drove back to Forster as the boat made its steady journey back as well. This was one of the most memorable trips I have taken in a very long time, made special by all those who came, as well as some fantastic diving. I only wish I was able to take the next trip we have running there in August.